Mohini makeovers had been working in makeup segment from a very long time and are experienced in all types of makeup. The usual daily attire to private kitty parties forms and wedding ceremony to many different forms. Mohini salon caters to requirements as per their brochure. The makeup is a long list to specify few among them are skin care, hair styling, nail work etc. Your blush should not be seen by you its place is there, its key is to use the principles involved in makeup and slowly building on top of them. Many times clients come who have not used blush before but sometimes had, still does not know the correct usage. 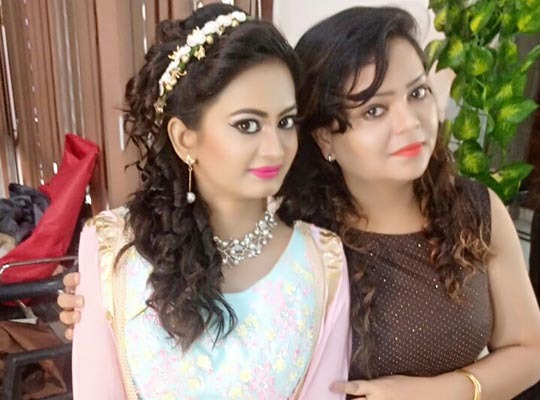 So Mohini makeovers helps customers in such situations by providing them theoretical and practical applications so they never feel themselves unhappy and alone without help. Fashion make up industry change at a very fast pace except few products various new come in very fast. Don’t fear that blush makes people look less charming, it is the technique used by Mohini makeovers which makes people very nice. Here deep skin tones need different treatments they need too light is not recommended because it will be too ashy; therefore it is not used in this context. When it comes to caramel type tones then Mohini suggests deep peach blush, skin with olive color needs different type of treatment. Warm color feel comes in medium skin tones, the treatment and blush given to them are of different types like bright ultra pigmented shade like a coral or pinky-y apricot. Mohini makeovers have specialized methods to provide best make up for different skin colors. The technique is developed from long experience of makeup and working in make up in particular. Pale skin is a different context here it requires different types of color, hat suit skin it is all here at Mohini it is a complex art requiring expertise of different level and standard it is here that perform the part that are to be in particular. Mohini are offering makeup in lucknow . They know their procedures and products well and hence provide a colourful and satisfying makeup service to clients . How to put make up depends on client’s skin as plays as base so it is necessary part which is going to play a vital role . Their (mohinis) makeup artists , now what they are doing , they are thoroughly grounded in their work , they have an enoromous amount of practice at their hands . They are experts and they treat their customers very well .